Partnerships allow aging-services providers to better serve seniors and help the world around them. Here are 3 stories of providers who partner to make a difference. Well-Spring Retirement Community, Greensboro, NC, has built partnerships for community and resident engagement, with strong resident involvement. One issue that has gained prominence among Well-Spring’s community-spirited residents is food insecurity. 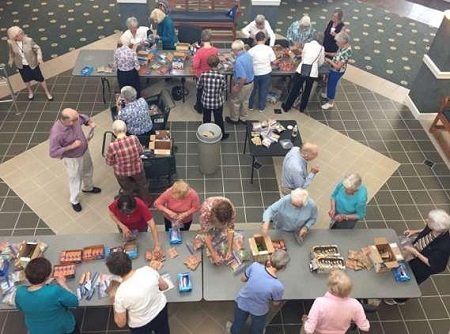 Residents created a Hunger Steering Group, which organizes food drives and food packing events. They arranged to have a local charity, Greensboro Urban Ministry, locate some of their food collection boxes on the campus. “Greensboro Urban Ministry is also one of the main recipients of our local ‘crop walk,’ which we participate in,” says Saake. A crop walk is similar to a walkathon, but participants gather pledges for pounds of food rather than dollars. “Half of the food [from crop walks] goes to world hunger and a quarter to national programs, and the other quarter stays in its locality,” says Well-Spring resident Skip MacMillan, who chairs the Hunger Steering Group. Well-Spring also makes financial donations. Residents also help the Out of the Garden project, a local organization focused on food insecurity of school-aged children. Residents and staff help pack backpacks for kids, both at the Out of the Garden warehouse and on the Well-Spring campus (allowing assisted living and skilled nursing residents to participate). Another type of partnership, with the University of North Carolina at Greensboro (UNCG), has helped create lifelong learning and engagement opportunities for residents while also helping students launch careers. Well-Spring has built relationships with various parts of UNCG. One is with its College of Visual and Performing Arts. A more ambitious partnership combines travel, entertainment and opportunities for arts students. The school takes selected students to New York to audition for various agents and theater companies with hopes of being able to perform professionally. Well-Spring takes residents and potential residents along. The weekend includes going to see dance companies, operas and performances on Broadway, and almost all have some connection with UNCG graduates. UNCG Department of Media Studies students do class projects by interviewing residents on video. Students helped create the video, Our Move To Well-Spring, about one couple’s move. Students have also created commercials for the in-house video channel and other pieces. Well-Spring regularly hosts internships for students in gerontology, family studies, nursing, kinesiology, recreational therapy, business and more. Art education students, many of whom are training to be public school teachers in art, offer classes to residents and learn from residents who are professional artists themselves. Other students offer creative writing classes and help residents who are writing their memoirs. UNCG business instructors help students work on their research skills by doing marketing studies on Well-Spring’s behalf. Well-Spring’s experience with such cooperative efforts demonstrates the impact that a retirement community can have on those who live and work around them. When St. Joseph Mercy Health System decided to close St. Joseph Mercy Saline, a 100,000-square-foot hospital in Saline, MI, Denise Rabidoux knew her organization faced a golden opportunity. Rabidoux is president and CEO of EHM Senior Solutions (EHM), a multi-site, full-continuum provider with campuses in Saline, Detroit and Sterling Heights, MI. “We are in the business of serving older adults and Washtenaw County has been a good home for us. The opportunity to expand our services in a location where we were already operating simply made sense,” she says. 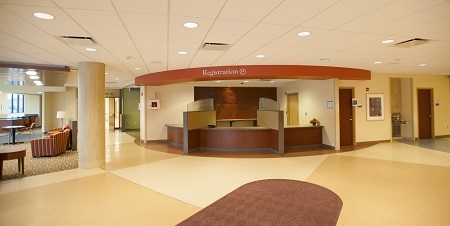 The hospital sits next door to Evangelical Home – Saline, one of EHM’s skilled nursing and rehabilitation communities. As neighbors, the 2 organizations had long-standing ties, and EHM had already been leasing space in the St. Joseph building for its Redies Center for Rehabilitation and Healthy Living, a short-term medical care and rehabilitation center. About one year ago, EHM reached an agreement to purchase the hospital building and it is now using the space to expand its offerings, but also to build partnerships with community groups. The vast size of the building allows plenty of space for EHM’s own service offerings. The campus is home to long-term care residents and those who come for the state-of-the-art Redies Center, a large healthy living and rehab center in the middle of two private-suite wings. The healthy living center includes an internet café for subacute rehab residents and a restaurant with systems equipped to interface with their electronic medical records. Much of the exercise and rehab equipment in the center is data-card driven, allowing easy tracking of a resident’s progress. EHM’s child care center, which also includes a latchkey program, has been expanded and now serves 67 children daily. EHM has moved its business office into the new space, and created a volunteer education center and an HR education resource in the space. Arbor Hospice & Palliative Care, a prominent Ann Arbor-area provider, is now leasing 8,000 square feet from EHM for its inpatient hospice residence. EHM is taking over and updating the Community Health Pavilion that was onsite—a space that allows local organizations to reserve rooms for events, 7 days per week. EHM has renovated space in the Pavilion to host—for $1 per year—Salt Valley Arts, an organization that provides studio and display space for 24 local artists. (These include potters, acrylic artists, glass artists, cyber artists and more.) Some of the artists also offer classes. “The Center will also house a healthy living demonstration space, including facilities for cooking classes, and we’re now working with Morrison Community Living to design that,” says Rabidoux. A large section of the old building is being gutted for construction of a new cardiac outpatient therapy center that will include a cardiac rehab tank, with an underwater treadmill. A number of local physicians are also leasing space for their practices into the building. Augustana Care, Minneapolis, MN, is partnering with Minnesota-based Tamarack Habilitation Technologies to help it validate a line of new friction reduction products designed to prevent and treat pressure ulcers while improving the lives of its residents. The first major initiative was a 2016 pilot study to mitigate the impact of heel and ankle ulcers for Augustana Care residents by applying a specially designed sock that reduces the friction and shear forces that contribute to pressure ulcers. The product applies low-friction fabric technology, GlideWear®, only in at-risk areas, where skin breakdown has previously occurred or where individuals are likely to develop ulcers. The pilot showed improvement in a group of 90 Augustana Care residents as a result of use of the product. In June, a randomized, controlled clinical trial began to compare the product to other treatments. Julie Thurn-Favilla, Augustana Care’s corporate director of skilled nursing facility clinical practice, was recently appointed to the National Pressure Ulcer Advisory Panel (NPUAP) Corporate Advisory Council due to Augustana Care’s research in this area. Gene Mitchell is editor of LeadingAge magazine.